Is there a better alternative to Collate? Is Collate really the best app in Productivity category? Will Collate work good on macOS 10.13.4? 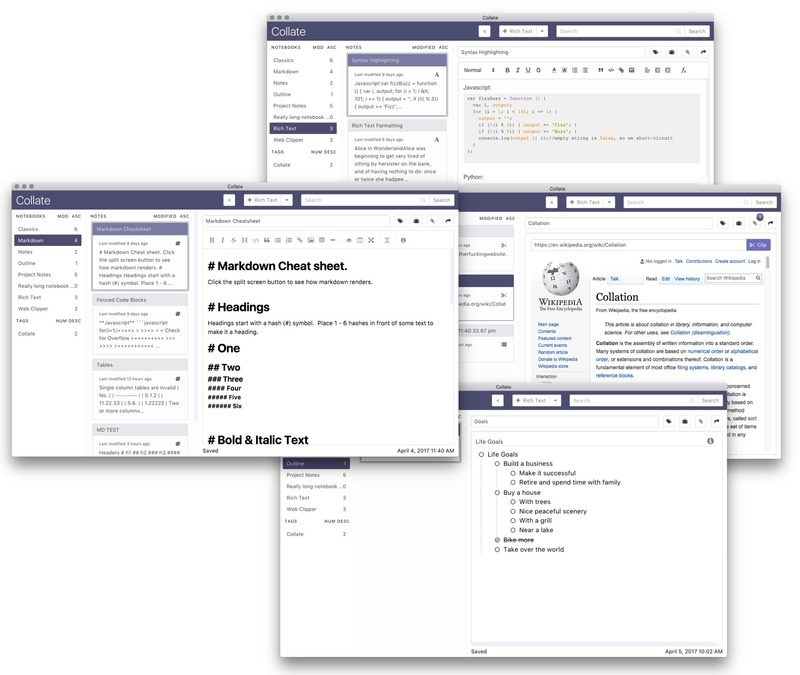 Collate is a privacy-focused, locally hosted, cross-platform note-taking application. 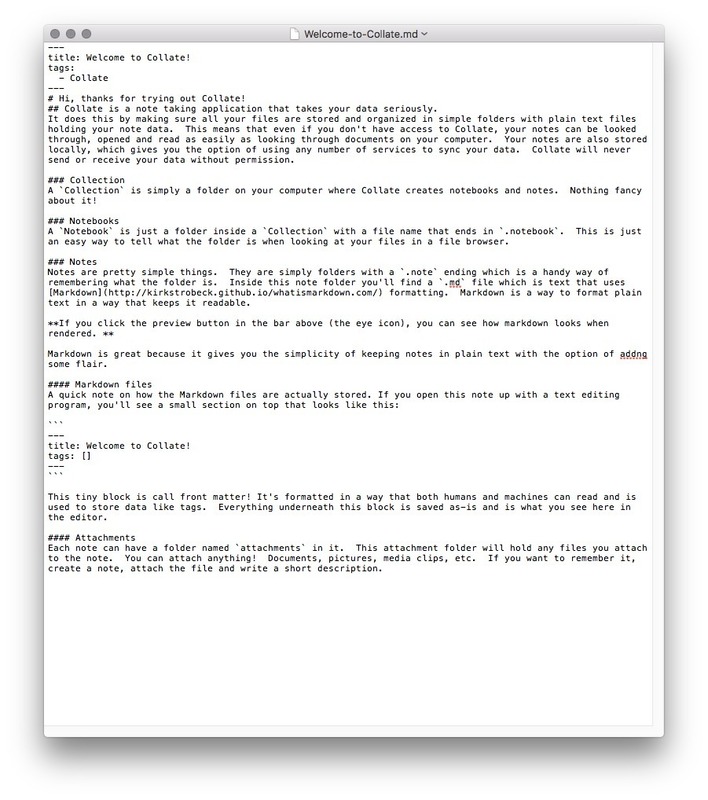 Note Types - Choose between markdown, rich text, outline or web clipper. Take notes your way with Collate Note Types. Choose between Rich Text, Markdown, Outline or Web Clipper note types to take notes more effectively. 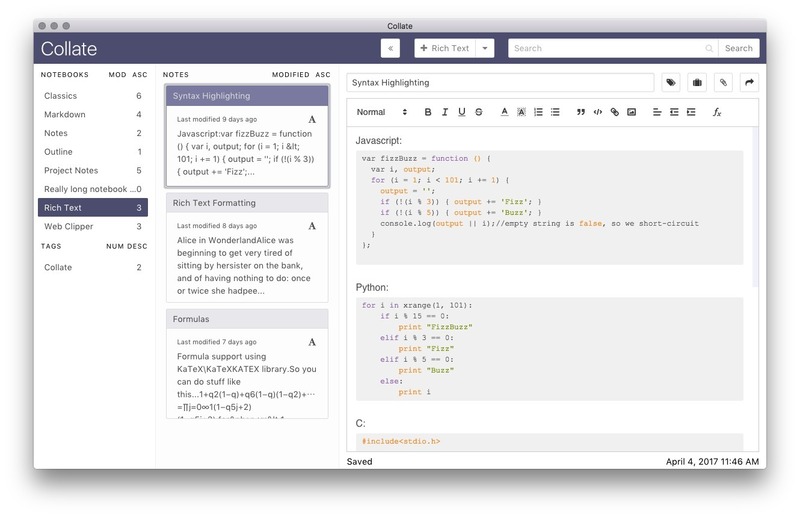 Cross-Platform - Available on MacOS, Windows and Linux Collate is committed to providing a cross platform desktop experience. It is currently available for MacOS, Windows, and Linux (.deb, .rpm, .AppImage, and .tar.gz supported). Collate needs a rating. Be the first to rate this app and get the discussion started! Organization - Stay organized with Collate Intelligent search, notebooks, tags, and attachments. Collate acts as a repository for all your important information. Other features include: Markdown editor supports Github Flavored Markdown & Syntax highlighting Built in web clipper (save webpages locally) Powerful search functionality Import your data from Evernote, Markdown files, and text files Print your notes or save to PDF File format built to be easy to navigate and use, even without Collate. Data Integrity - Your data, your choice Other note taking systems tuck your data away in databases or proprietary data formats which can be difficult to export or read. Collate is built around the idea that your data should always be accessible and human readable. Check out an example collection here or learn about the format.